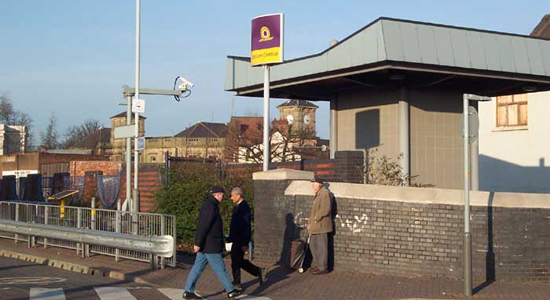 A myth to dispel at the outset is that Bilston Central Metro stop is not built on the site of Bilston Central station (close, but not exactly the same spot): for those who wish to read more on this debate please visit the page for Bilston Central. 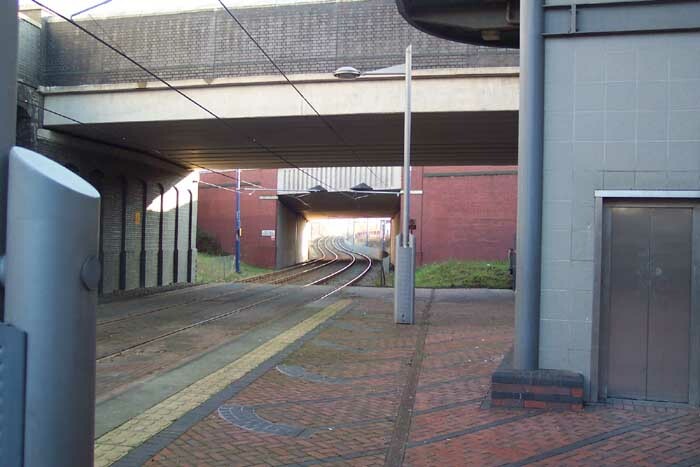 Above we see the entrance to Bilston Central from Hall Drive/Stafford Street next to the central bus garage - the strange 'mushroom' next to the Metro sign is the top of the lift shaft which leads to track level. 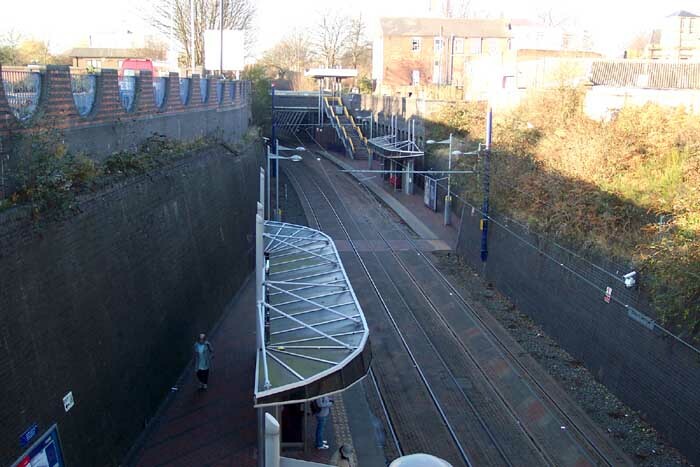 Above-left we are standing at the top of the stairs leading down to track level and are looking in the direction of Priestfield and Wolverhampton. 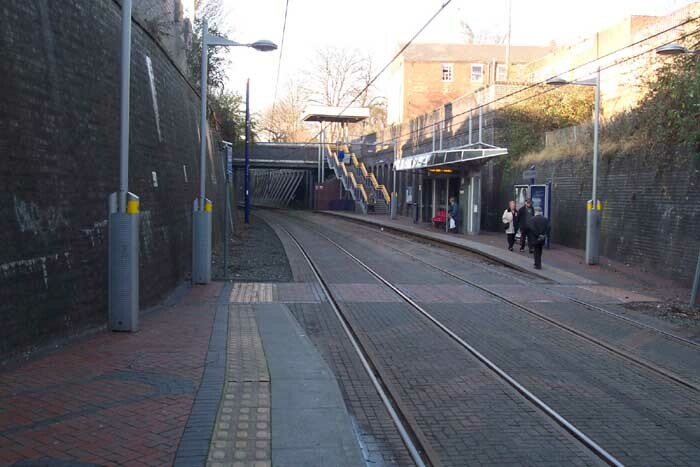 As can be seen, the stop is in a deep cutting lined with blue brick and, uniquely for the Metro, has staggered platforms. Above-right we are on the Wolverhampton platform looking towards Wolverhampton and can see the Birmingham platforms further down the track on the right-hand side: the narrowness of the cutting necessitated such a staggering of platforms. Above-left and above-right we are looking towards Birmingham through the Hall Drive (foreground) and Black Country Route bridges. 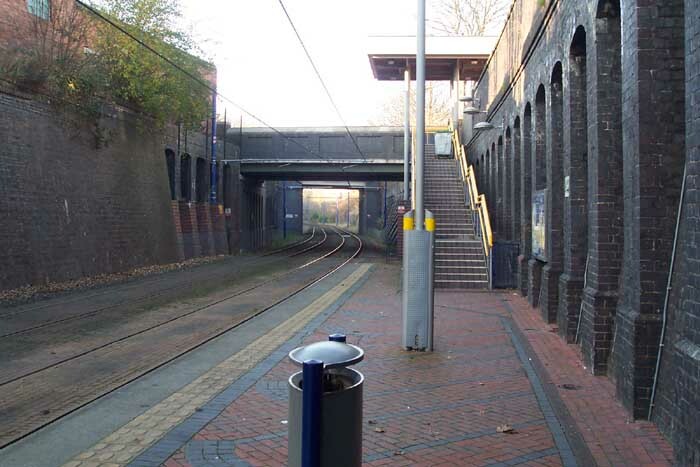 The old Bilston Central station began on the far side of the Hall Drive bridge (the Black Country Route not existing then) and stretched away from this spot. To further add to this argument, with regard to the enforced staggering of platforms can you imagine a large GWR station shoehorned into the Metro stop space?